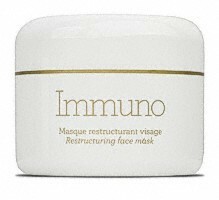 Immuno is a rejuvenating mask that suits all skin types and all ages. However it must not to be used on skins with extreme inflammation, dermatitis, eczema or psoriasis. Immuno is the most important mask in the GERnétic method. It rejuvenates the basal cells, restores the skin functions and defence mechanisms. It is also purifying and astringent, which makes it ideal for oily or acne prone skins.